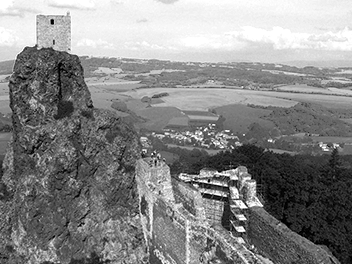 Written in the Czech Landscape is a retrospective of Czech landscape studies carried out from 2003 to 2009 by graduate students at Penn State University. Sponsored through the Department of Landscape Architecture at Penn State, students and faculty in the university’s summer academic programs collaborated with a variety of Czech agencies to study growth and development impacts on heritage sites. While reports, meeting records and presentations were the program’s primary outcome, program participants also formed profound impressions of Czech places and people. The images in this exhibit express the connections to and insights about the many inspiring landscapes that were studied and visited. The multimedia exhibition includes photographs, drawings, collages and design plans. Written in the Czech landscape will be on display in the NCSML’s Smith Gallery through March 23, 2014.